Today we had a full day to explore Munich including Marienplatz, Odeonsplatz and the Christmas markets. 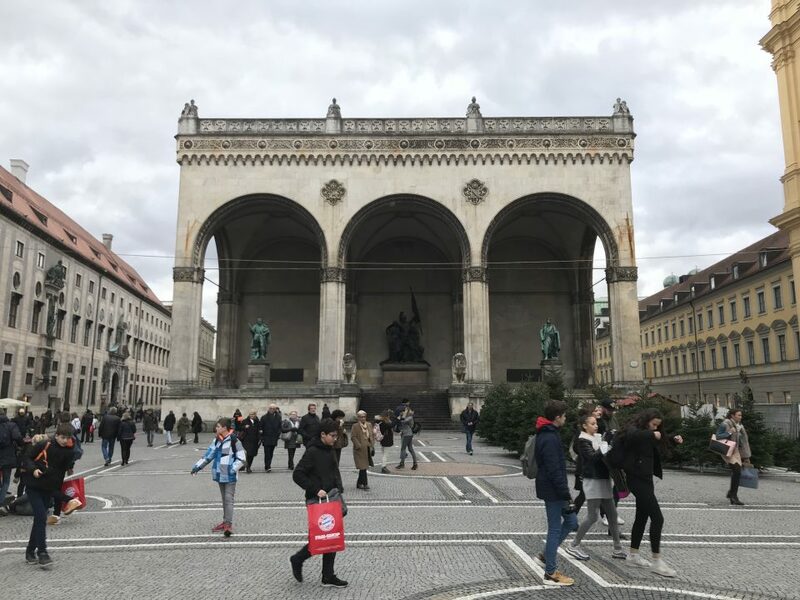 We had a small taster of Munich yesterday when we saw Karlsplatz and some of the Christmas markets in the city centre. Once we left the hotel it was only a short walk to the S-Bahn and then a short ride to Marienplatz. Amusement was supplied by my mother-in-law who couldn’t quite work out which way was left or right on the tube. The first order of business was to get some breakfast, which we consumed in a nice cafe called Rischart on the main square. All washed down with a strong coffee. We then admired the view of Marienplatz which is Munich’s main square and the home of the main Christmas Market. The square is dominated by the impressive Neues Rathaus. 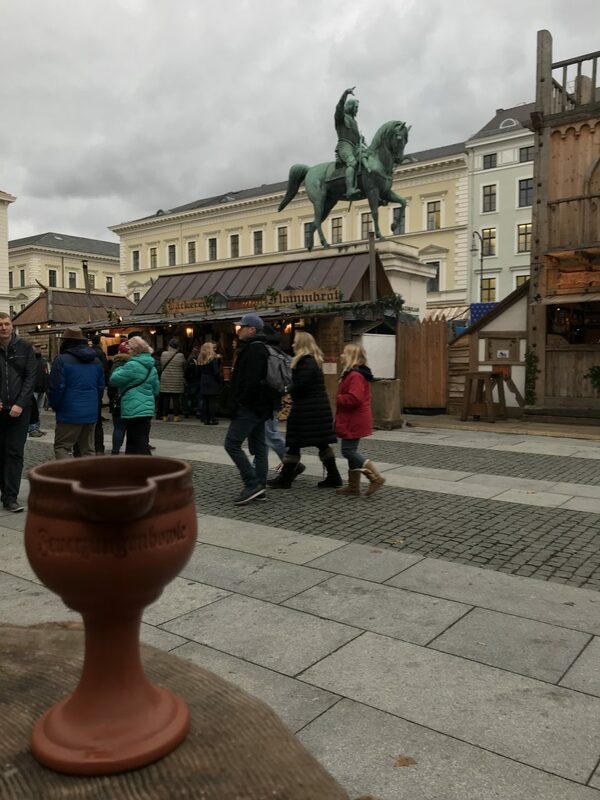 The wife was so scared by the gargoyles and dragons on the building that she had to buy a glühwein to recover. Or so she told me! We had a look around the Christmas market while we waited for the Glockenspiel display at noon. Basically this intriguing display is a series of figurines rotating to the sound of over 40 bells. There were so many people in the square watching that you couldn’t move. After a light liquid refreshment we made our way back to the Glockenspiel Tower. Not to look at it this time, but to take a lift to the top in exchange for only €3. Bargain! 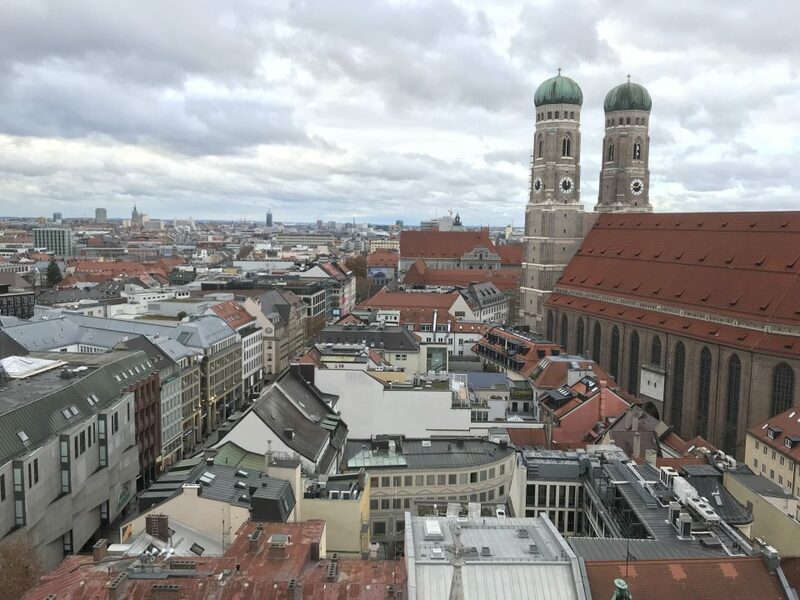 The views at the top were incredible, you could not only see all round the city of Munich but also admire same graffiti from previous visitors too. We then made our way to Odeonsplatz to catch a glimpse of Residenz. This palace was closely guarded by four lion statues. Quite a lot of visitors seemed to go up to these lion statues to clean their noses. Apparently this wasn’t because the lions had a nasty cold, but to give the person good luck. 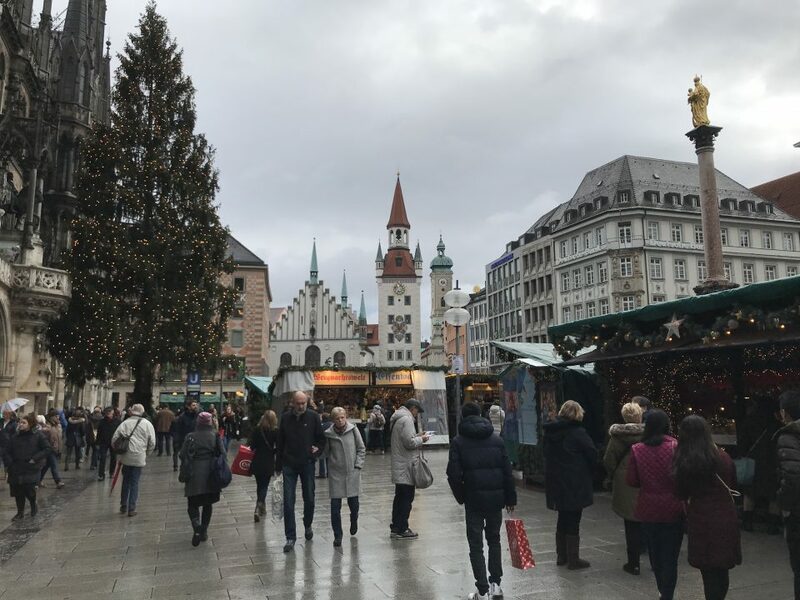 It was only a short walk from Odeonsplatz to Munich’s medieval Christmas market. As the name suggests this market has a medieval theme with the all stalls and staff being dressed appropriately for that time period. But we did spot one medieval gentleman break character and use his iPhone. The wife and I enjoyed a delicious glühwein and rum in a medieval style chalice. Yes it may have cost us a small fortune but it was mainly for the novelty factor. It’s never about the money, honest! For our evening meal we headed out to Gasthaus Zur Festwiese, a traditional German restaurant near our hotel. 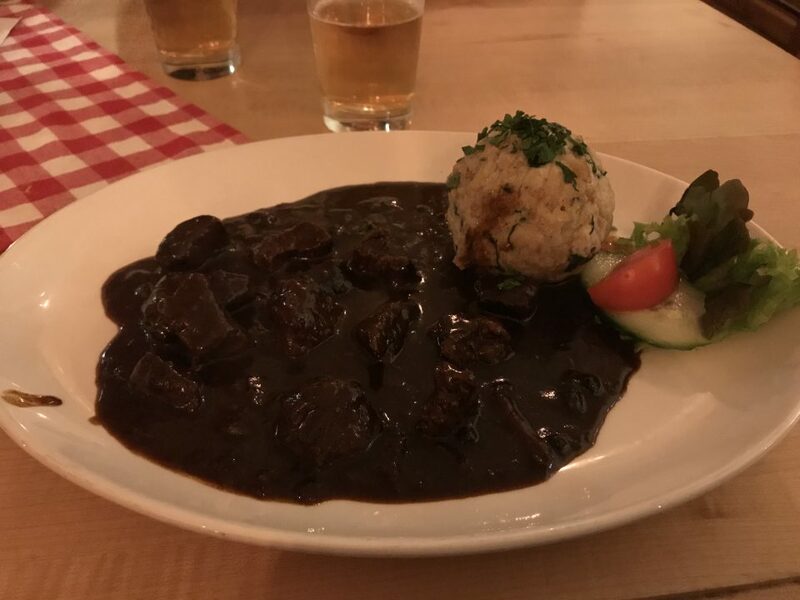 I opted for beef goulash with dumpling. it was absolutely delicious and I didn’t want the meal to end. We are off to Nuremberg tomorrow and we hope for an equally good day there too. Really enjoyed today’s blog on Munich & the medieval market.